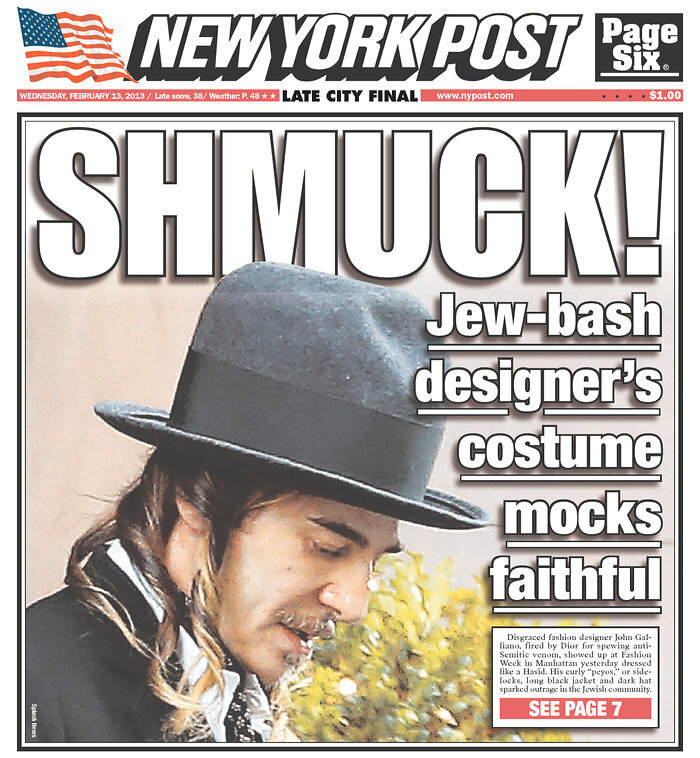 The New York Post is claiming John Galliano was mocking Jewish Hasidic culture on Tuesday when he stepped out of a New York apartment building wearing a “parody of Jew attire“. The British designer was banished from the fashion industry after a 2011 incident in which he reportedly insulted Jewish people and claimed to love Hitler, but has recently made a tentative return via a temporary residency at Oscar De La Renta’s New York studio. While the New York Post are obviously trying to create a visual stir to outdo that presented by Galliano, their desire to whip up controversy is almost embarrassingly obvious beneath the facade. We can already comfortably assume from his career choice that clothes are fairly important to John Galliano, so it’s unlikely the outfit he chose was simply the first he tripped over that day. He was making a provocative statement that he was hoping people would react to. He doesn’t care whether it’s positive or negative. But perversely, by responding to it, the NY Post and other media outlets could be accused of casually trading off and diluting the Jewish community’s right to be offended by genuine anti-Semitic gestures. This is not an anti-Semitic statement. I repeat, it’s a provocative statement. This is a fashion designer, the enfant terrible of the fashion world, using clothing to create a stir that will keep him in the news. That’s his job. Perhaps the journalists at the NY Post should consider doing theirs.